It’s a truism, that life often takes unexpected twists and turns. This is particularly true if you embark on a lengthy journey, which is what Pete and I did this past June. 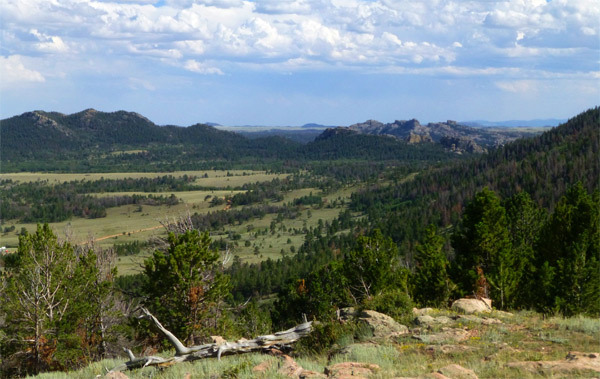 We’d ridden over 500 miles in southern Colorado in 2011, and had planned to pick up where we left off. This was no mean feat, since it necessitated trailering our three Icelandic horses from our home in Palmer, Alaska to our starting point at Hagerman Pass outside of Leadville, Colorado. Our first major stop was Dave and CJ’s place outside of Cheyenne, Wyoming. We’d recently purchased Synergist saddles for Pete’s gelding, Mr. Siggi and for my mare Raudhetta. Pete had said that his saddle didn’t yet feel quite right. And I wanted to meet CJ who had become an email penpal. Dave (in very short order) made the necessary adjustments to Pete’s saddle. Then off we went, on what was to be a three month, 700 mile trip. I have to say that the next three weeks were the best ever, in part because my saddle fit Raudi and I so well. Previously, her overly-large saddle slipped up onto her shoulders, causing her to buck when going downhill. And both Raudi and Mr. Siggi soon developed white patches on their backs. This was not the case this time around. We went up and down several major passes, with Pete’s horse Mr. Siggi usually in the lead. Then the unforeseen happened. We were nearing the top of Argentine Pass when Mr. Siggi slipped on a boulder, lost his balance, and tumbled over the side of the mountain. Pete and I both looked at one another and began sobbing. Understand, Mr. Siggi was a kind, gentle fellow who an animal communicator had once said was “one with the universe.” And he and Pete were connected at the heart. We hustled back down the mountain, leading Signy, our pack horse, and Raudhetta. The storm clouds were rolling in, so I set up camp. Pete took off, to see if perhaps Mr. Siggi might still be alive. Two hours later, he returned, set down Mr. Siggi’s saddle next to the trail, and told me that the blue dun had died of a head injury. Together, we examined the saddle. It was beat up, but we guessed the tree was still intact. Between bouts of grief (which came in waves), Pete and I began to pick up the literal and figurative pieces. The next day we relocated to the Peru Creek camping area, which is outside of Montezuma. We decided that we’d continue in the direction of home, doing day trips. Pete returned to Carbondale and got the truck and trailer. Signy would now be Pete’s riding horse. The problem was that we’d need to find her a good quality saddle. 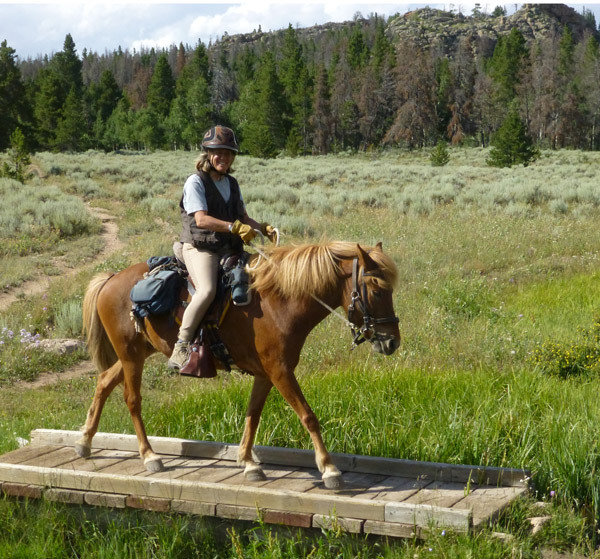 We’d talked at length with CJ, Dave, and Tom about saddle fit, so we were by now well aware that her older treeless saddle would be inadequate longer day treks. 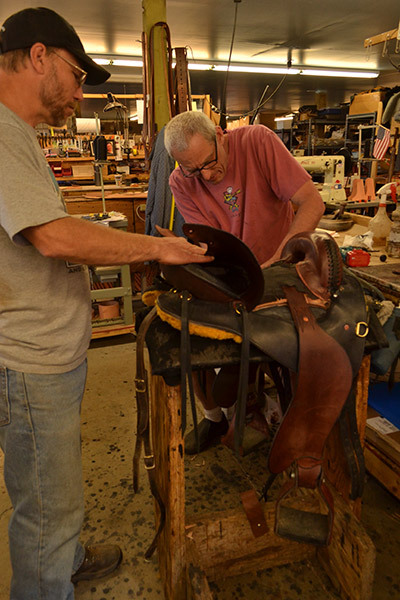 Both Pete and I thought that perhaps Mr. Siggi’s old saddle could be modified and/or rebuilt. So we called Synergist. CJ (of course) told us to bring it back, which is what we did. CJ, Dave, and Tom welcomed us with open arms. And that very day, Dave began to rebuild what would eventually become Signy’s saddle. The process included using an Equimeasure pad, so that the tree would better fit the older mare’s back. As importantly, these wonderful people took us in. Pete and I pride ourselves on being tough, resourceful, and independent. However, this was an instance in which human intervention was both needed and welcome. All at Synergist assisted us in dealing with the loss of our good buddy. This is the life’s twist and turn part – Mr. Siggi was the horse who brought us to Synergist Saddles the first time around. And he was the horse who brought us there the second time around. This was not what we planned or expected to happen. However, we consider ourselves lucky to have become lifelong friends with these very remarkable people. This made me cry in sadness for your loss, and in joy because there are still people like CJ in this world. Hugs to all of you.